Lately, I stopped using my BB creams because the color from the SKIN79 VIP Gold has become a little off on my face. I look weird up to the point that it looks ashy. 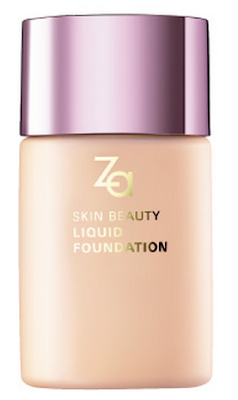 So, for the past week, I have been using ZA Skin Beauty Liquid Foundation. I bought it last month and didn't have the chance to try it then because my skin is behaving badly (peeling off and getting red on my cheeks). Provides a natural, even ﬁnish while minimizing the appearance of pores and uneven skin tone. Contains as much hyaluronic acid as a bottle of essence. I squeeze about a 2-cm diameter of product on the back of my hand. Using a foundation brush, I dipped it on the product, take off the excess by patting it on a clean area on the back of my hand, then lightly sweep all over the face. Afterwards, I use a clean sponge to smooth out any streaks to achieve a smooth, flawless-looking face. P.S : I'm currently holding an international giveaway because my blog just had it's anniversary a few months back. To join the giveaway, simply click >>HERE<< . This sounds like an interesting foundation, especially the minimizing pores and evening skin tone part! What's your all time favourite base/foundation? ?